It is a violation of Federal law to use this product in a manner inconsistent with its labeling. FOR OUTDOOR USE ONLY. NEVER LEAVE ANY BURNING CANDLE UNATTENDED. DO NOT USE WATER TO EXTINGUISH. To reduce annoyance of mosquitoes, use one or more candles in still air. Best results within 3 feet. Do not use indoors or in enclosed areas such as garages, porches or tents. Place candles at least 18 inches apart. Container may become hot; handle carefully. Place on heat-resistant surface away from anything flammable and out of reach of children or pets. Do not move candle while burning or before wax hardens. Always extinguish flame before moving. Do not BLOW OUT OR use water to extinguish — smother flammable material to extinguish. Keep wick trimmed to ½ inch or less at all times. Keep candles free of matches or other foreign matter, which may present a fire hazard. Discontinue use when 1 inch of wax remains. 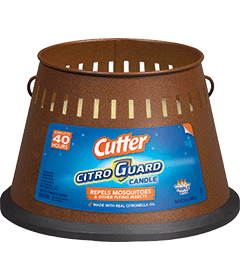 To maximize the repellent barrier, use several Cutter® CitroGuard™ Candles to create perimeter protection against flying insects. Remove label before burning.